Главная / Иностранные языки / презентация по английскому языку"Canada"
The word Canada comes from one of the Red Indian languages – “Kannata”, meaning “a number of huts”. 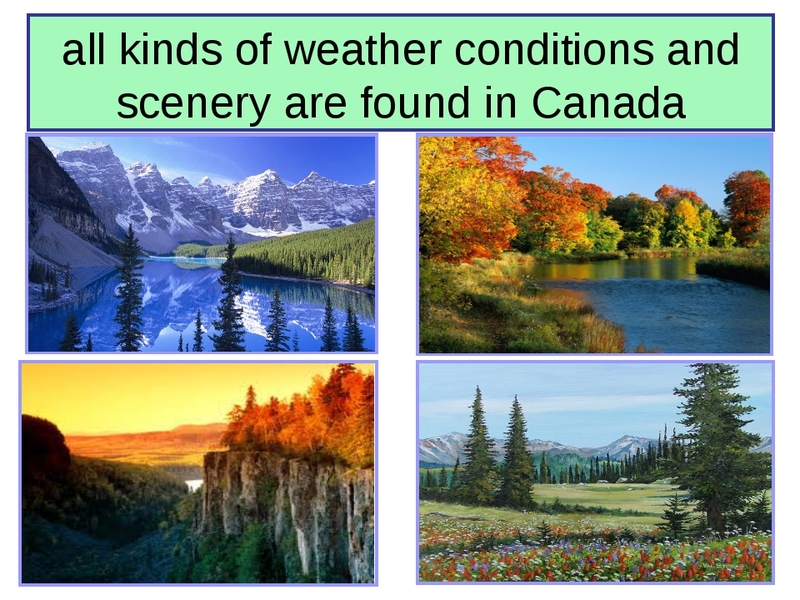 Canada is often called the “Land of the Maple Leaf”. The story of Canada goes back over 400 years. 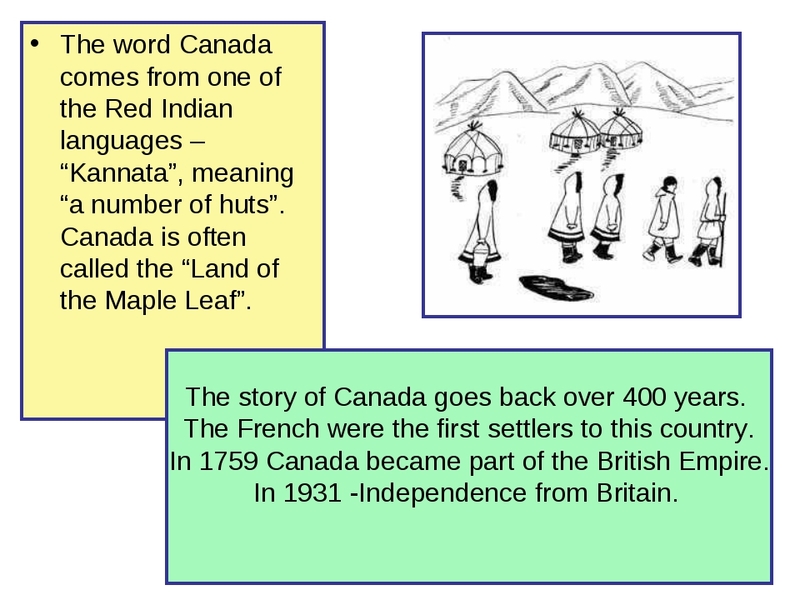 The French were the first settlers to this country. In 1759 Canada became part of the British Empire. In 1931 -Independence from Britain. Ottawa the capital of Canada National symbol- the maple leaf Official languages of Canada are English and French. Nearly 60 percent of the population speak English and 27 percent speak French. The rest speaks other languages, such as Eskimo, Indian, German, Ukrainian and Italian. 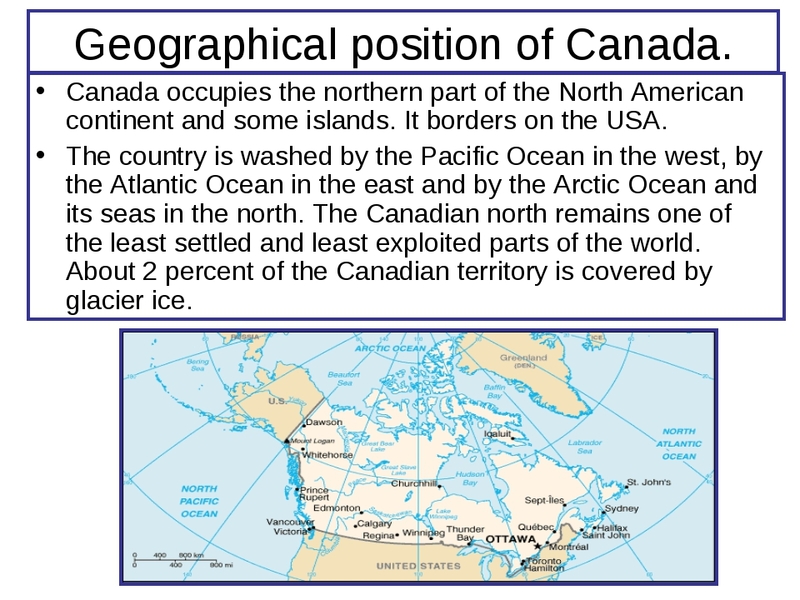 Geographical position of Canada. 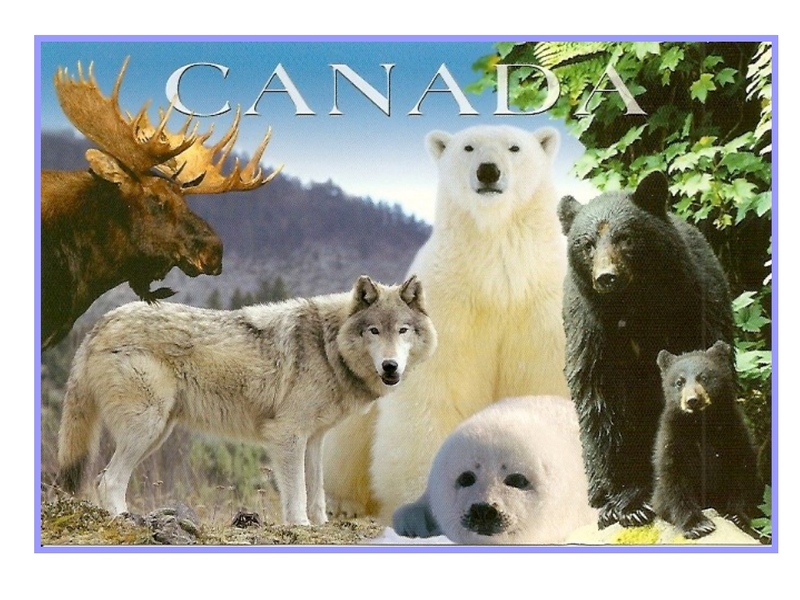 Canada occupies the northern part of the North American continent and some islands. It borders on the USA. The country is washed by the Pacific Ocean in the west, by the Atlantic Ocean in the east and by the Arctic Ocean and its seas in the north. The Canadian north remains one of the least settled and least exploited parts of the world. About 2 percent of the Canadian territory is covered by glacier ice. The eastern parts of the country are mainly valleys and plains. 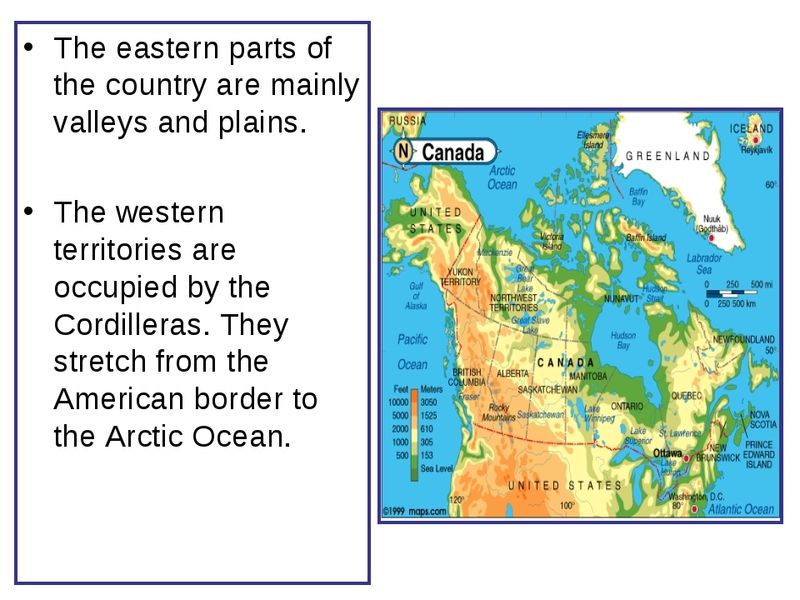 The western territories are occupied by the Cordilleras. They stretch from the American border to the Arctic Ocean. The main Canadian islands are Newfoundland, Victorian Island, Baffin Island and others. 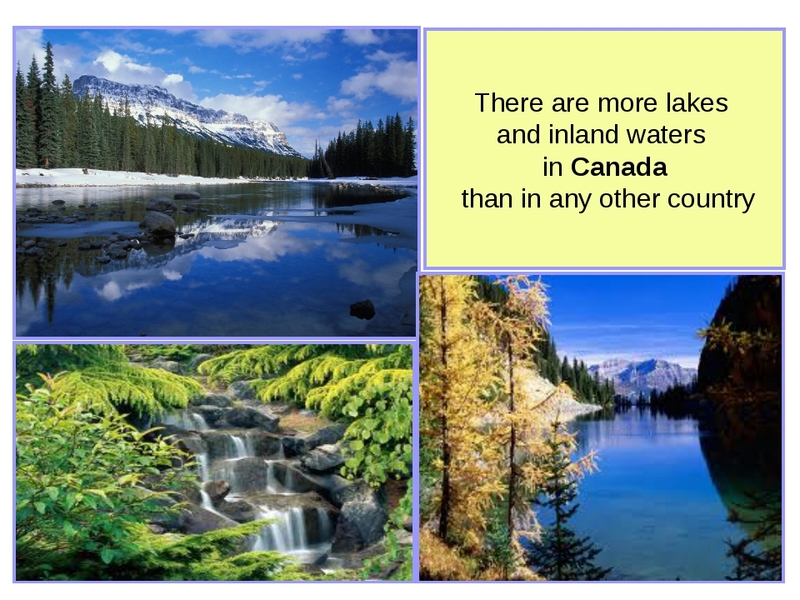 There are a lot of rivers and lakes in Canada. 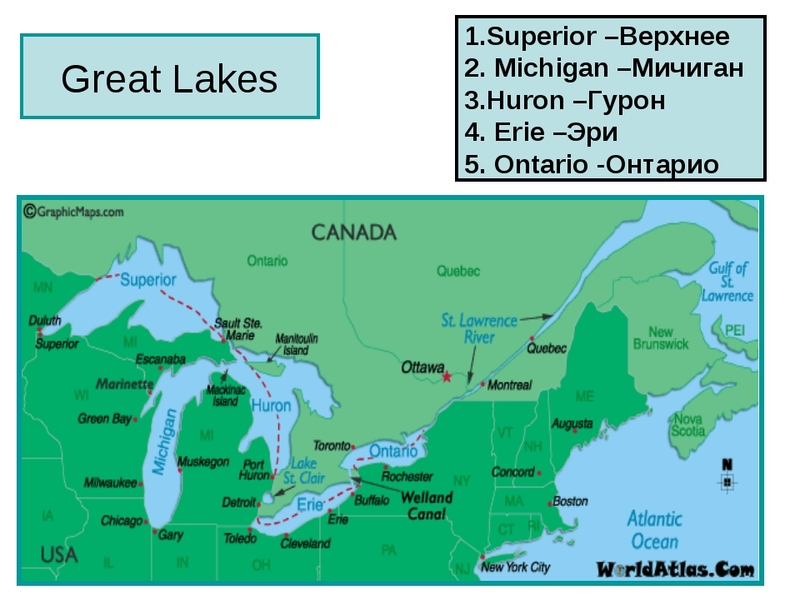 Among them there are the Great Bear Lake, the Great Slave Lake and the Great Lakes District. The largest rivers are the Nelson, the Ottawa, the Mackenzie and the Yukon. The capital of Canada Ottawa, which is situated on the bank of the Ottawa River. 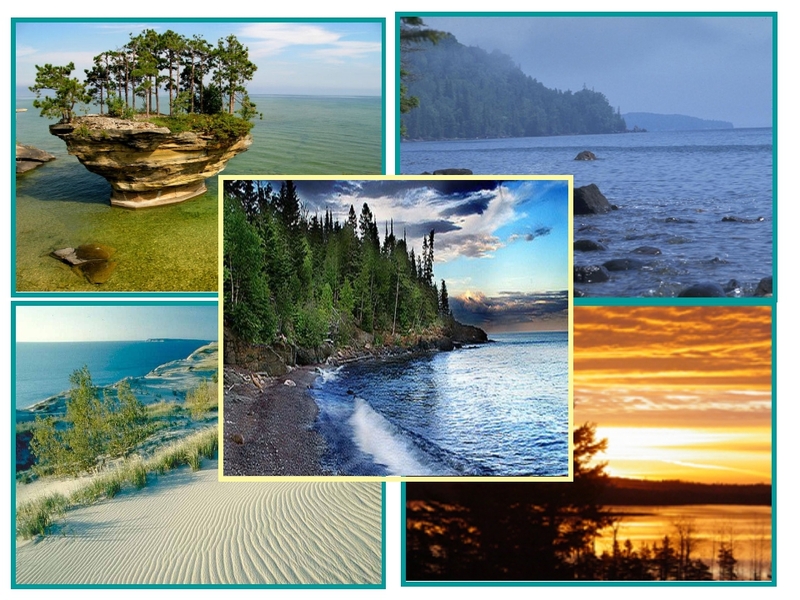 It is famous for its beautiful parks. It is also known as the city of bridges. Canadian industries produce cars, airliners, locomotives, sea vessels, snow-removal machines, and agricultural equipment. The most developed industries are timber, mining, chemical, meat and milk and food industries. 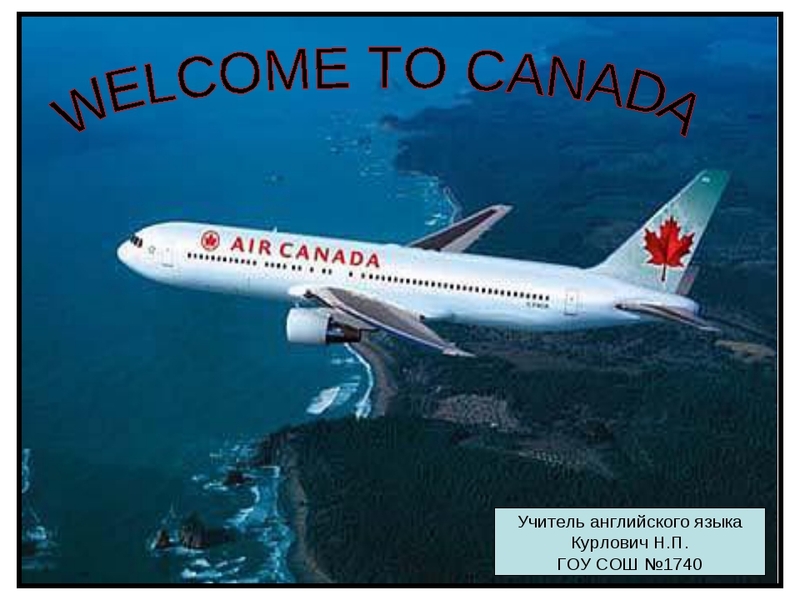 Canada grows wheat, barley(ячмень), flax(лён), potatoes, vegetables and fruit. Fishing is also one of the prosperous industries. 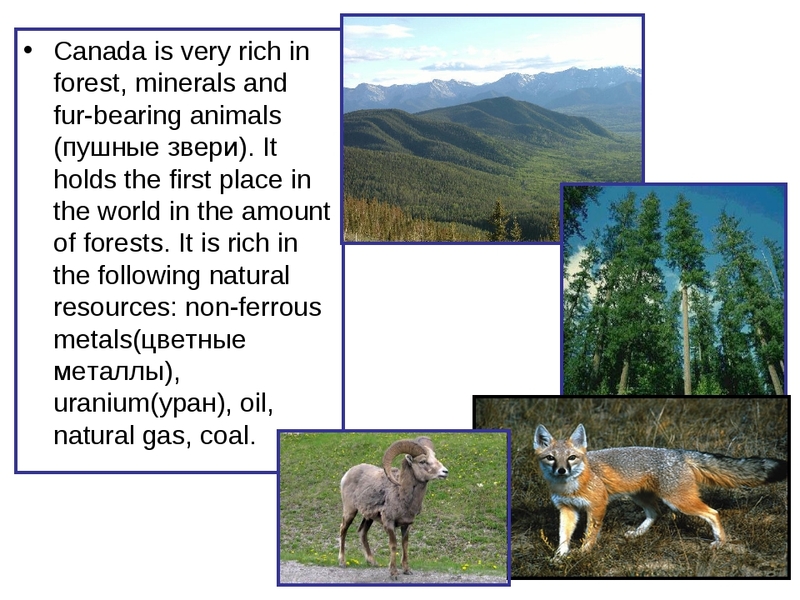 Canada is very rich in forest, minerals and fur-bearing animals (пушные звери). It holds the first place in the world in the amount of forests. It is rich in the following natural resources: non-ferrous metals(цветные металлы), uranium(уран), oil, natural gas, coal. 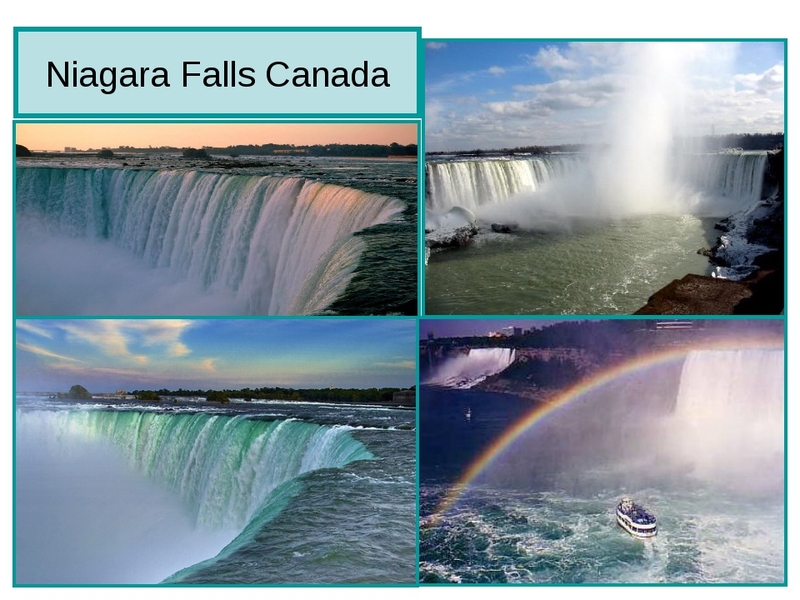 The Niagara Falls are waterfalls on the Niagara River, straddling the international border between the Canadian province of Ontario and the U.S. state of New York. 1. Horseshoe Falls -подкова), Канадский водопад . Canadian Falls) 2. American Falls - Американский водопад ) 3. Bridal Veil Falls -Фата). 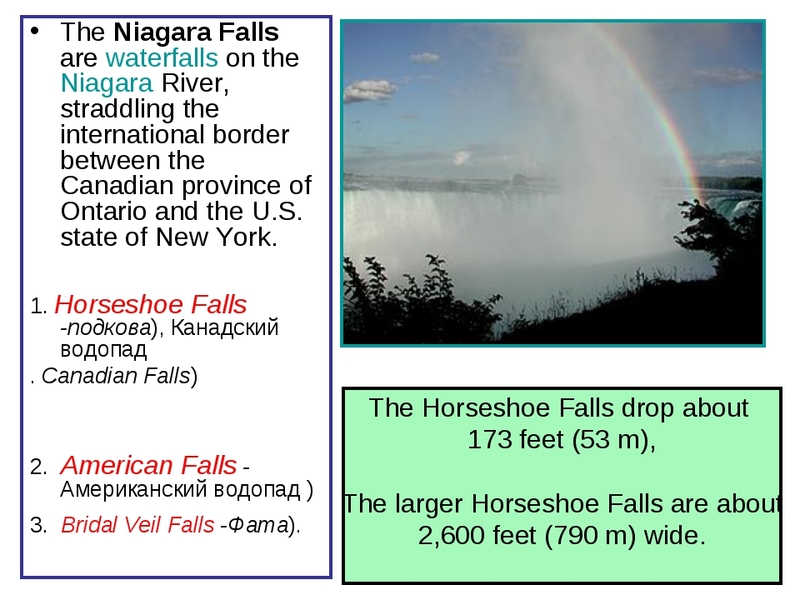 The Horseshoe Falls drop about 173 feet (53 m), The larger Horseshoe Falls are about 2,600 feet (790 m) wide. 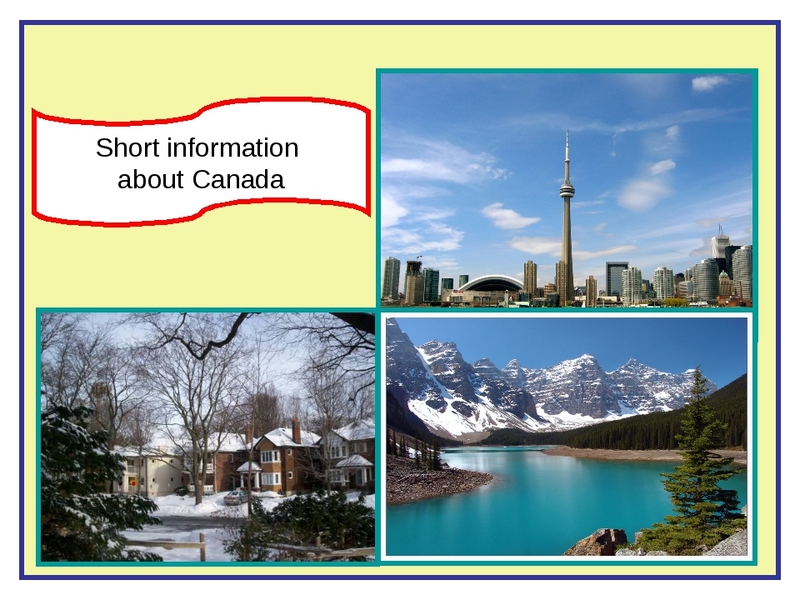 Answer the questions Where is Canada situated? What does the word “canada”mean? 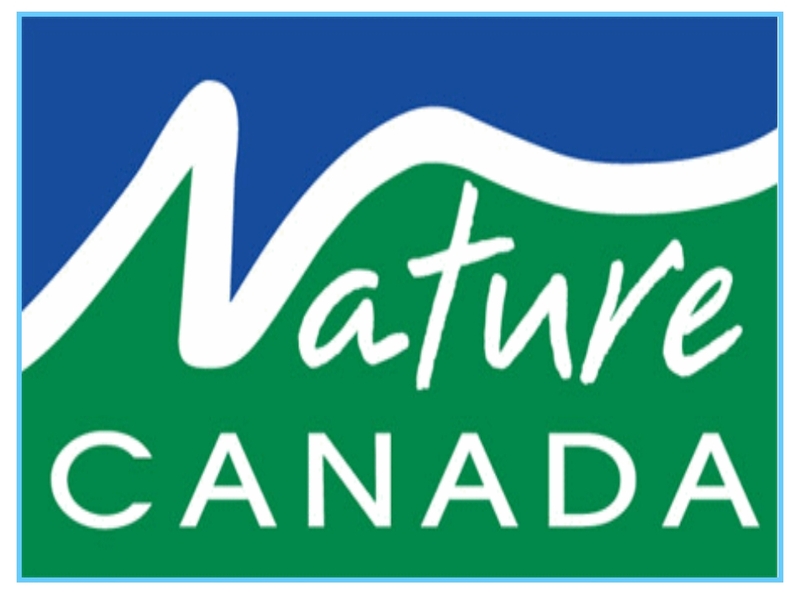 What is the national symbol of Canada? What languages are spoken in Canada? 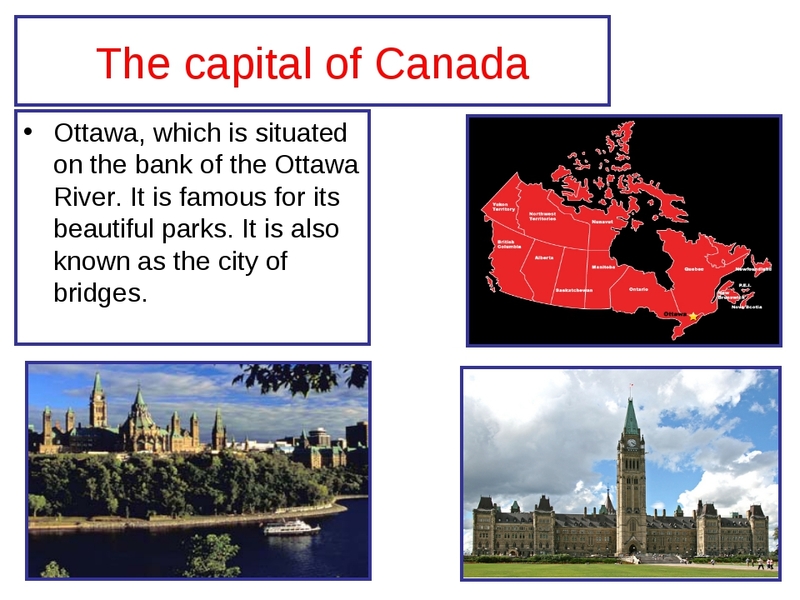 What is the capital of Canada? 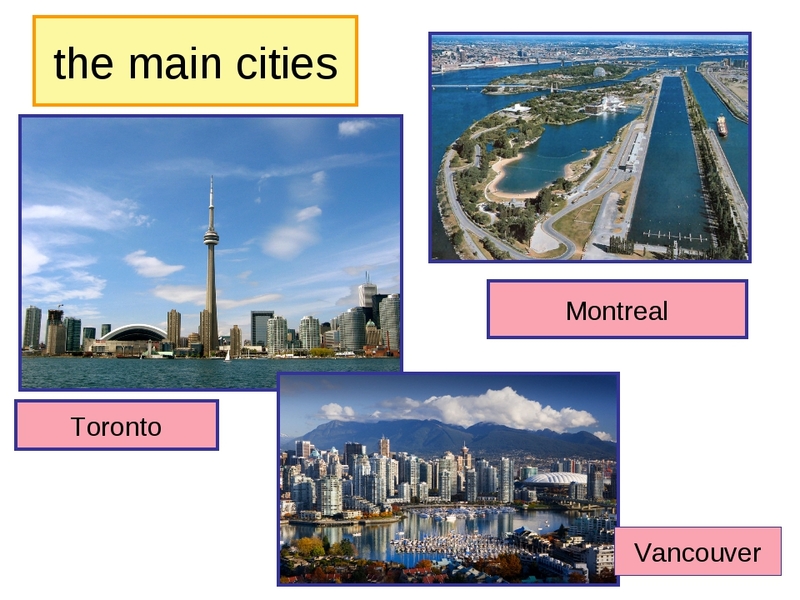 What other cities are there in Canada? 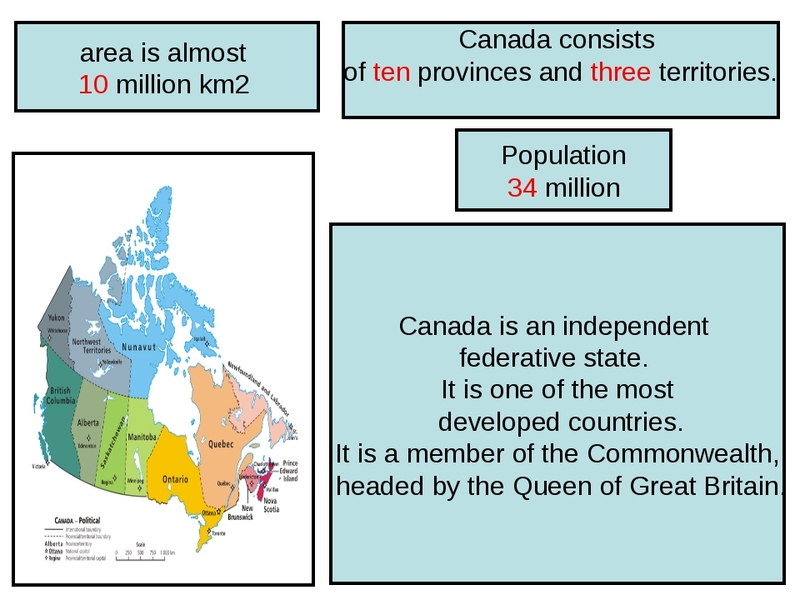 How many provinces and territories in Canada? How many people live in Canada? 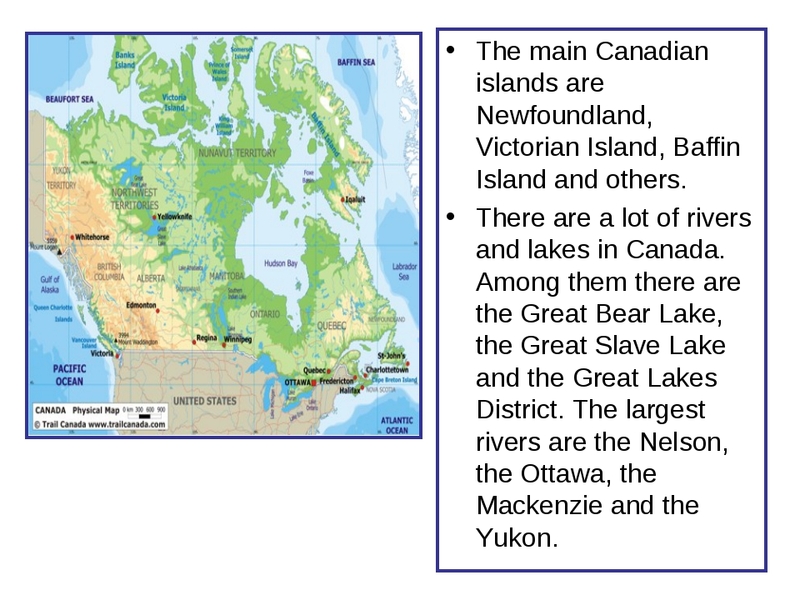 What are the main islands are included into Canada? 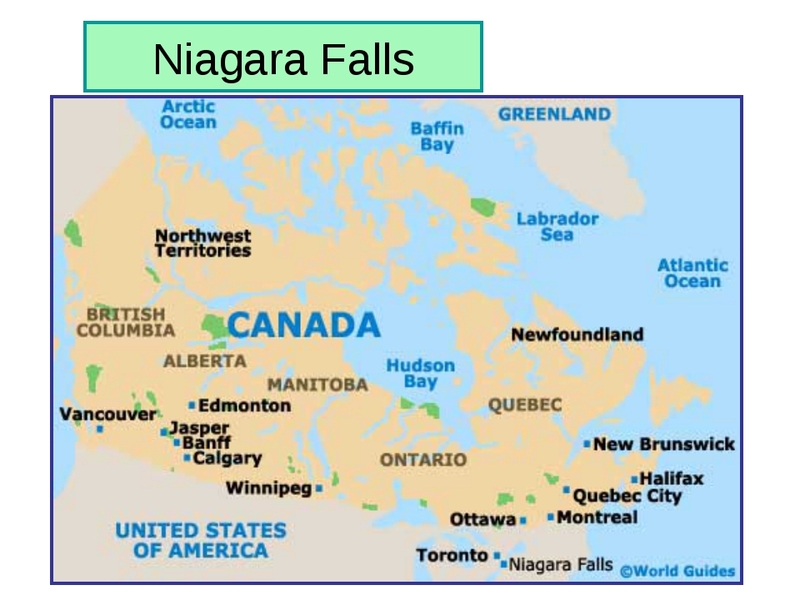 What are the main rivers in Canada? 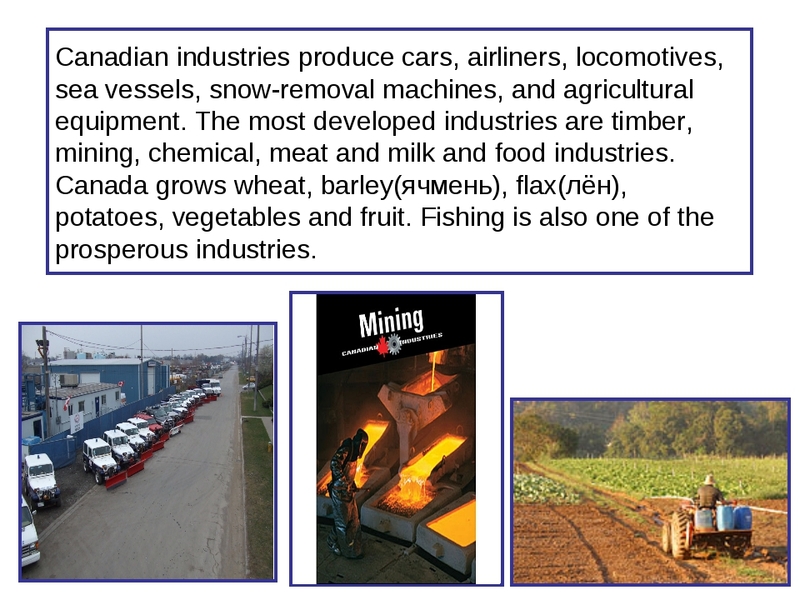 What are the main industries in Canada? 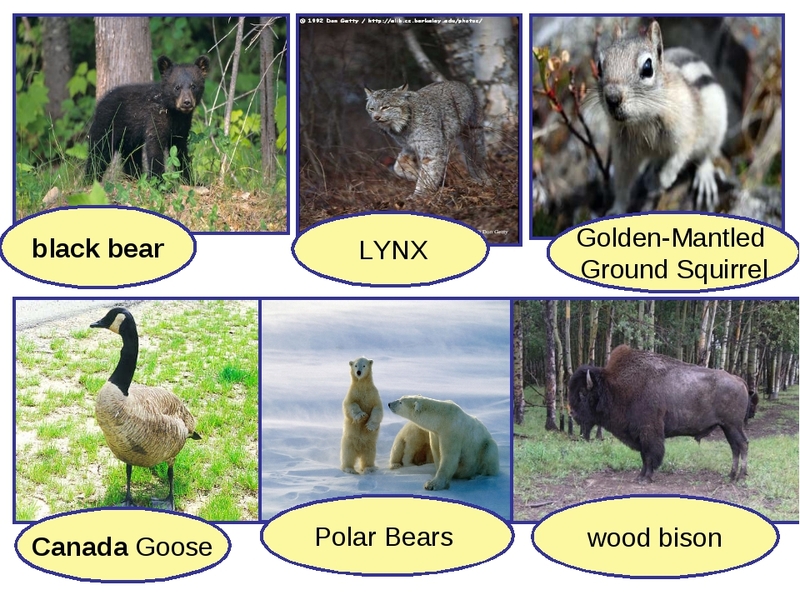 Canada is rich in nature and animals, isn’t it? Why? 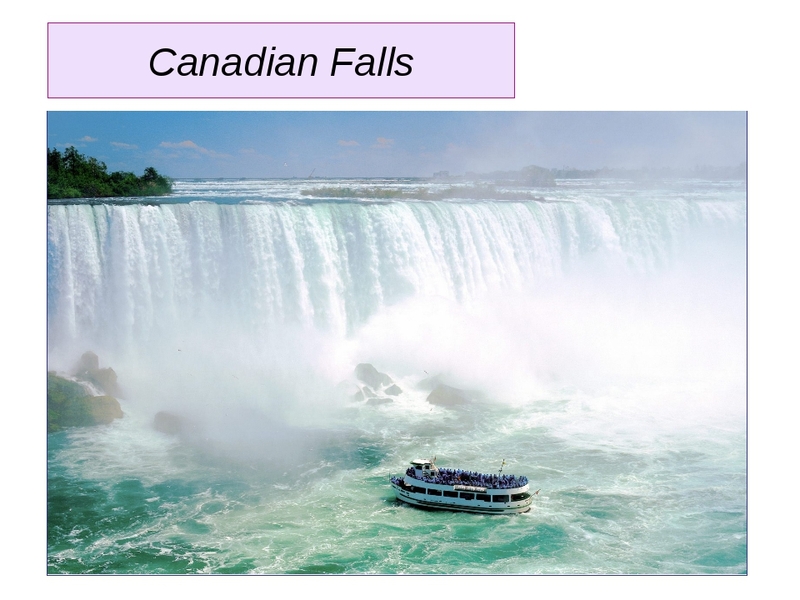 What is the name of Canadian Falls? 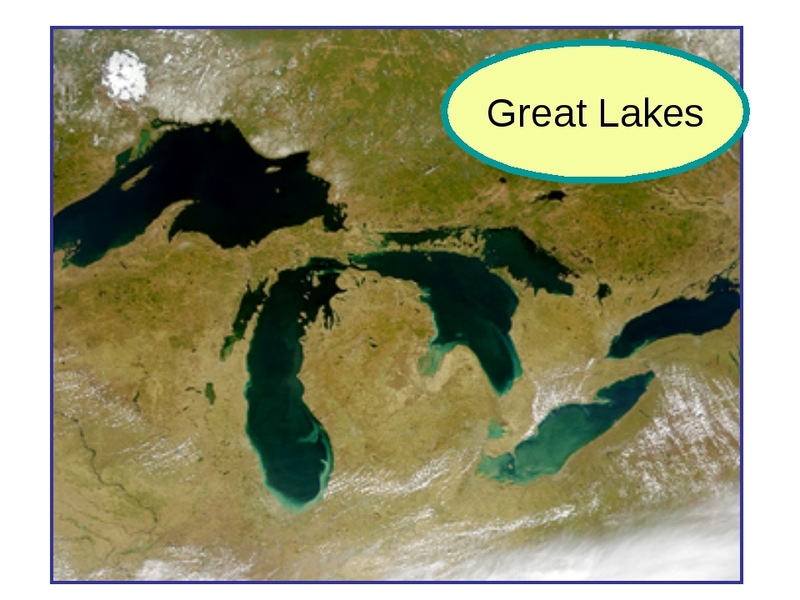 What are the names of Great Lakes? 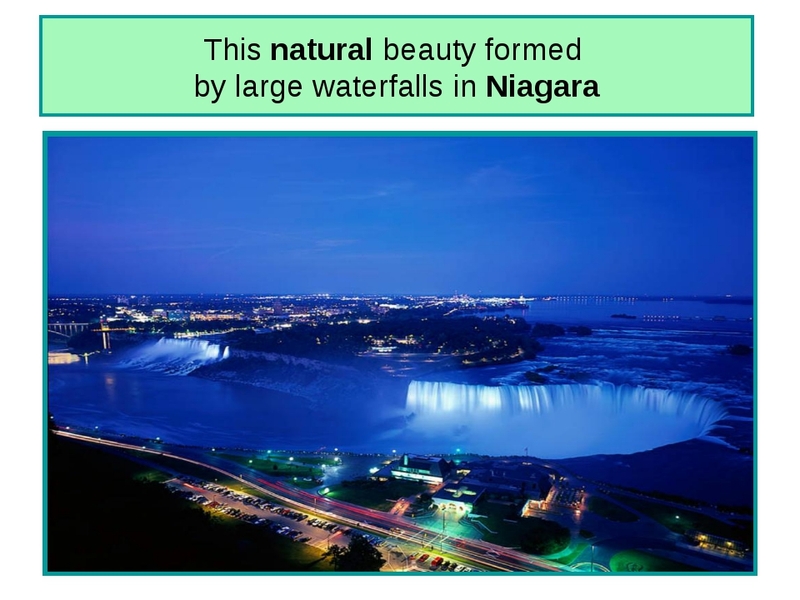 It is situated on the North American continent. In size Canada is the second in the world after Russia. 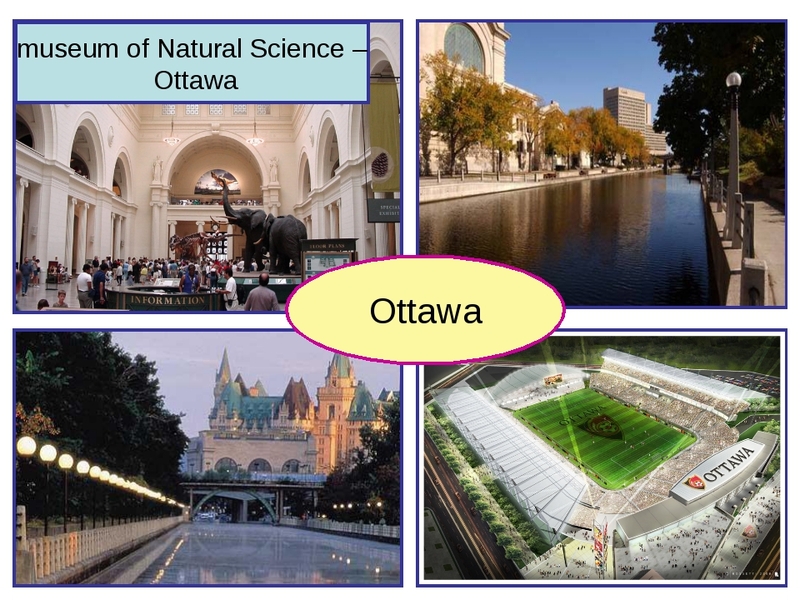 Its area is almost 10 million km2.The capital of Canada is Ottawa, which is situated on the bank of the Ottawa River. It is famous for its beautiful parks. It is also known as the city of bridges. 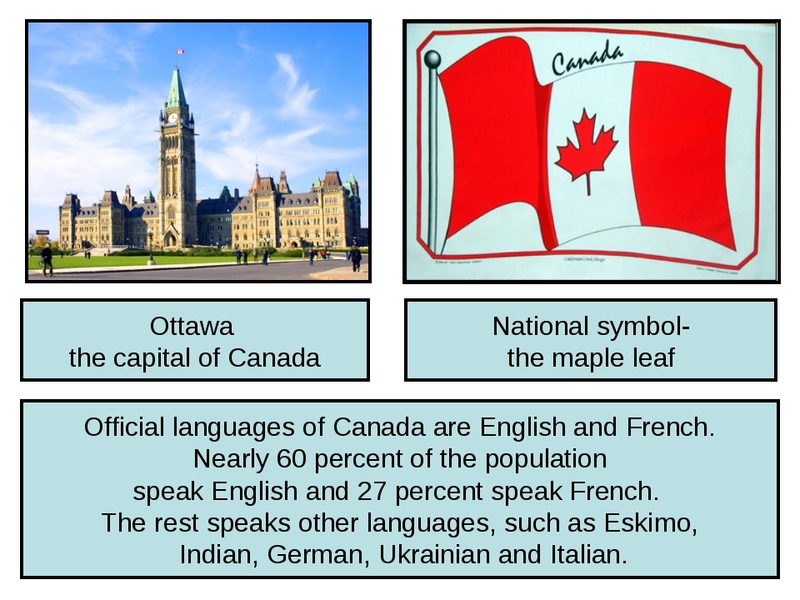 Official languages of Canada are English and French. Nearly 60 percent of the population speak English and 27 percent speak French. The rest speaks other languages, such as Eskimo, Indian, German,Ukrainian and Italian.